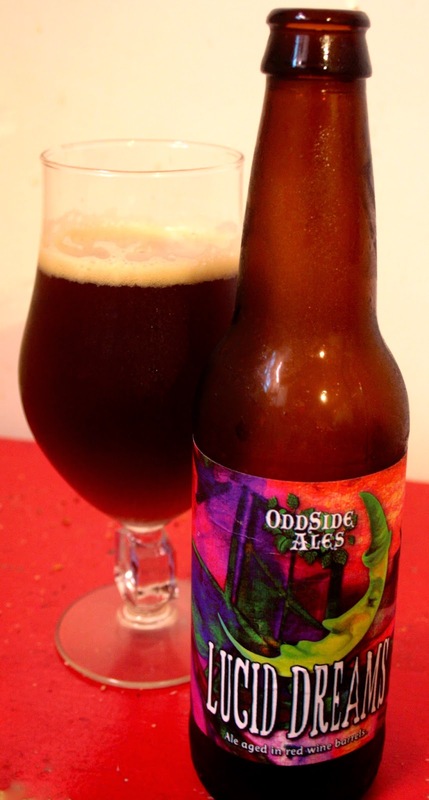 In business for the last four years (and bottling a variety of their liquids for about the past two) Grand Haven's Odd Side Ales has become one of the fastest growing breweries in the state of Michigan. With the amount of beermakers there are in the Mitten now (and, it seems, a new one opening up every week) and, that Odd Side's distribution is currently kept only within state lines, they must be doing something right. Aged in red wine barrels, this Dubbel style ale pours a hazy firebrick red in color with a two finger fizzy, bubbly head that melts into consistent ring that hangs through the rest of it's session. The smell of fermented grapes are obvious when giving it whiff followed by currants, a dash of black pepper, some toast, vanilla and a slight nudge of oak. Buttery and candied malts that are common in the Dubbel style come out in the front and back of the initial sip. What those flavors surround though, such as tart cherries, a medium tannic that is found in a lot of Merlot's along with a dash of tobacco and some light pepper notes, give this creamy but quite lively to the feel brew a curveball of complexities that makes it individual and unique. The barrel aged factor of it is somewhat muted all the way through save for the when it drifts it way in at the finish amongst a blend of farmhouse ale funkiness, red wine astringents and Dubbel sweet notes in the finish. If you know of someone who claims to be just a wine drinker that has a tendency to turn it's nose up to beer of any kind this may be the kind of thing that changes their mind and open them up to the many different offerings, ideas and interesting things the brewmasters of this country (and especially this state) are up. It's ain't no soda pop tasting wine cooler (or whatever those bright colored "malt beverages are suppose to be.) It also goes well equally with something to sip after doing yard work or a quiet fancy dinner with the sweetheart of your choice.